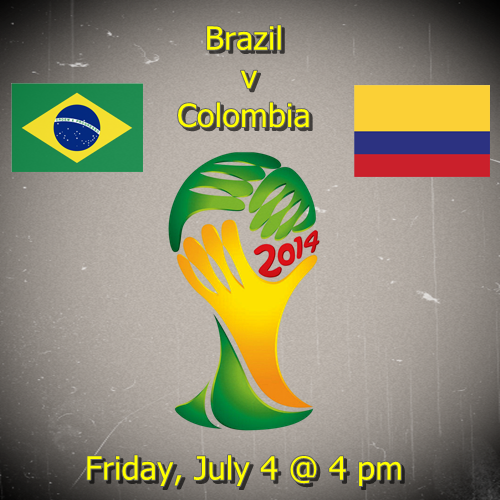 This Friday, July 4 features two of the four quarterfinal matches for the 2014 World Cup with Brazil vs Colombia playing in the late game at 4:00 pm. Brazil and Colombia have both made it this far by taking the top spot in their respective groups by winning all three of their matches. So far Colombia has looked the far more convincing side out of these two. While Brazil has continued to win, they have benefitted from playing against lesser opposition as well as being able to play at home. Their two strikers, Fred and Jo, have been almost non-existent in this World Cup. The amount of finishes that they have missed has been unbelievable. There are many more question marks surrounding Brazil, especially after needing to go to penalties against Chile. This was a match that will certainly have taken a lot out of the Selecao and they will be without their defensive midfielder, Gustavo. Colombia, meanwhile, came through their round of 16 with a very comfortable 2-0 win over Uruguay. Their number 10, James Rodriguez, has put in a player of the tournament performance time and time again and will be the key player for Colombia. My prediction is for a full time draw that ends with a Colombia winner in extra time. Colombia are my favorites to win this one regardless. Brazil can rely on Neymar and the home fans for only so long. They lack much of an attacking threat up front while Colombia look very dangerous going forward every time.